If children in your area did not start back to school in the last week or so, they will be in session before too long. 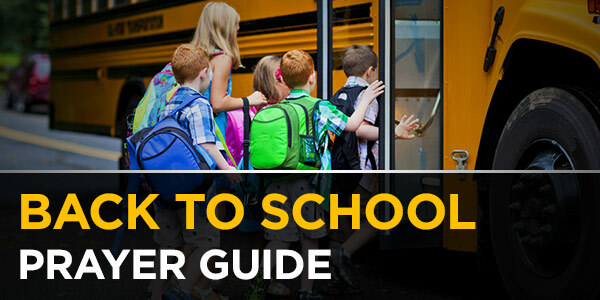 “Back-to-school” is a societal and seasonal turning point in America. It seems that when the school year begins, everything in our lives shifts and resets. The annual ritual of heading back to school is also spiritually significant for our children’s futures. They start fresh, also, with new teachers and new subjects, maybe new friends and new interests that could unfold into their destiny in Christ. Who Will Shape Our Children’s Mindsets? Our children spend a little more of their weekday lives in school than at home and they are in school for about nine months out of every year. Teachers are the single most important adult influencers in our children’s lives outside of their families, simply because of the significant amount of time they will spend in the classroom together. The character and nature of those teachers and what they believe can profoundly impact our children. What’s being taught and the environment of the schools is also important. Many school boards are approving curriculum that often challenges the Word of God, and local school boards have recently instituted policies that are anti-biblical, such as transgender “bathroom policies”. Parents are often left out of the loop and uninformed. However, it is crucial that we stay involved and add action to our intercession. Pray for the students from preschool to college. Pray that God will grant them a passion and grace to learn new things. Believe that the Lord will place your child in the perfect classroom environment, whether public school, private school or homeschool. Ask the Lord to give each student the right teachers for individual learning style and needs. Believe that God can line things up perfectly for all children, so that they might eventually find their destinies. Pray for the teachers to have patience, grace, love for their students, and a love of teaching! Pray that their enthusiasm flows down to the students entrusted to them for this school year. Lift the administrators of your local schools to the Lord, from the secretaries and principals to the school boards and superintendents. Decree that the policies of your school district’s administrators will not discriminate against Christian children and families, but rather that Christians will be welcome. Pray that children can pray freely and read and study the Bible openly without repercussions. Use your keys of authority to close the door to anti-Christ and/or immoral philosophies and doctrines in your district. Ask the Lord to raise up more Christians as teachers and leaders in the education system. More salt and light is needed there. It wasn’t long ago that we felt schools were a relatively safe place to drop our kids off each day. Oh, there was the occasional school bully on the playground, but overall, it was safe. Now, bullying has gone to a new level with cyber-bullying—posting malicious or embarrassing comments or photos on social media sites—driving some students into depression and even suicide. There have even been shootings and other serious violence in our schools. We know that as parents and caring citizens we must take an active role in praying and acting to ensure our Christian children can get a quality education in a safe environment. Pray Psalm 91 over your schools and all that are within them daily. Pray that bullying of any kind will be dealt with strongly and stopped immediately. Ask the Lord to raise up counselors in the schools who are equipped to provide compassion to bullied students, as well as anti-bullying education to the students and teachers. Bullying is the result of poor self-esteem on the part of both the perpetrator and the victim. Rebuke the spirit of bullying and release the spirit of identity in Christ. Command that any plans in the darkness be exposed in Jesus’ Name. Ask the Lord to shine His light on anything in the works that could harm the students and others in the schools daily. Ask the Lord to pour out His love and compassion on the schools and help cultivate an environment where learning is fun, challenging and safe on a day to day basis. Prayer walk your local schools, especially the one(s) your child(ren) attend! Some are easy to walk around, but some have layouts that may require you to pray around them on a weekend. It never hurts to ask if you can walk the halls of the school and pray. Some schools allow it, especially if they know you. If your schedule allows for it, volunteer in your child’s classroom this fall. Or, volunteer in other ways—in the library or reading programs or help in the lunchroom or office. Find out how your school utilizes volunteers and go for it! If you can’t volunteer in the classroom, get to know the teacher and principal. Make appointments to meet them and discuss your child’s experience in the classroom. Always be kind and gracious. The better they know you, the more influence you will have when sticky situations arise. Pray with your children daily before school for their school day, for their teachers, for their administrators and classmates. Let them learn to lead the way in these prayer times. Encourage your child to write notes of encouragement to the teacher, draw them pictures or bring them cookies they helped bake. Again, the better they know your child, the more they will care about your little one. Attend school board meetings. Educate yourself on issues they are discussing and voting on. Make yourself heard when you don’t agree. Attend PTA meeting and help make the school environment more God-friendly. Find a friend or two and meet in a home or on the phone regularly to pray for your school. Home-schooling? Make prayer for your school days a regular part of the curriculum. What a wonderful way to start every school day – in prayer! Most of all, have a wonderful school year and may God cause Christian children to rise to the top in every arena of influence across this nation, gradually shifting our society to one that honors God again in America!